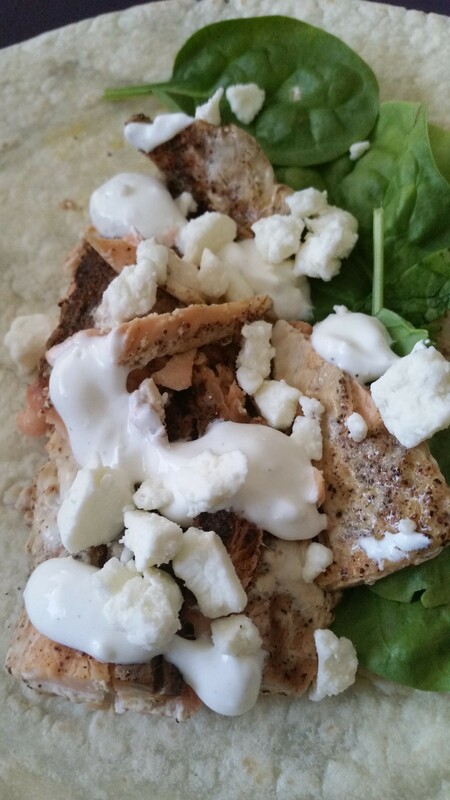 Roasted Salmon Tacos with Lemon and Feta Cream Sauce – What's for Dinner Moms? My postings have been a bit sporadic lately. I am posting entirely from my phone or tablet since my laptop died two weeks ago. This is such a minor thing in the scheme of life but it is entirely frustrating to me as it takes so much longer to create a post and I don’t have the same capability to edit my photos. So you get the raw pictures of my plate. My family loves salmon and I don’t make it nearly often enough. This is such a simple meal that it took about 30 minutes to make and have us seated at the table! This was so very delicious. The salmon was perfectly cooked and the cream sauce added a hint of freshness to the whole dish. We just added some baby spinach leaves to our tacos but you can add whatever you like to yours! I served this with a hearty side salad for a complete meal. Preheat oven to 425 degrees. Prepare a baking dish by coating with olive oil. Sprinkle salmon with chili powder and salt. Place in pan. Top with 1 tablespoon lemon juice sprinkled over salmon. Roast for 12 to 15 minutes depending on the thickness of the fish. Wrap tortillas in aluminum foil and warm in the oven with the salmon. Mix together sour cream, remaining lemon juice, garlic powder, and salt to taste. Mix in feta if you like or serve separately on top. Flake fish and place on a warm tortilla with your choice of toppings. Serve warm. Marc,i ever try whipped Feta (with lemon or lime) to dollop on any Fish Tacos? Delish! I have never heard of whipped Feta. Need to look this up! Thank you! Its great stuff-Make it a lot-sometimes called Crema by some cooks Marci! I love salmon. That sounds interesting! Omg this sounds/looks soooo delicious. I can’t wait to try it. Thank you. Thank you! I hope you would like it. Mixing the Feta with the sour cream sounds wonderful.